Asked whether she is aware that she is considered by many as Romney’s “stabilizer,” or the campaign’s “secret weapon,” Ann said that she did. 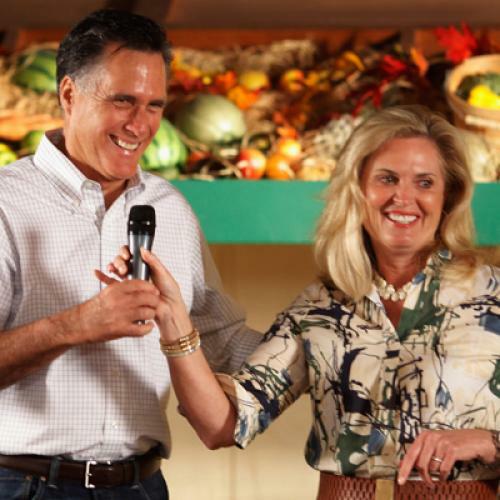 The Romney inner circle is well aware of Ann Romney’s potential [for campaigning on her own to promote her husband] - but has long resisted any strategy that would separate the couple for extended periods because of the negative impact it has on the candidate. Boy, as robots go, Romney sure needs a lot of careful tending! Or maybe he’s...not actually as much of a robot as people have made him out to be. This also, of course, raises questions about a Romney presidency. Would Ann need to go along on all the extended foreign trips, to make sure his “sharper edges” didn’t cause any international incidents—such as, for instance, when he’s visiting our “number one geopolitical foe,” Russia?